But the re-release news had begun back on Tuesday, November 13. 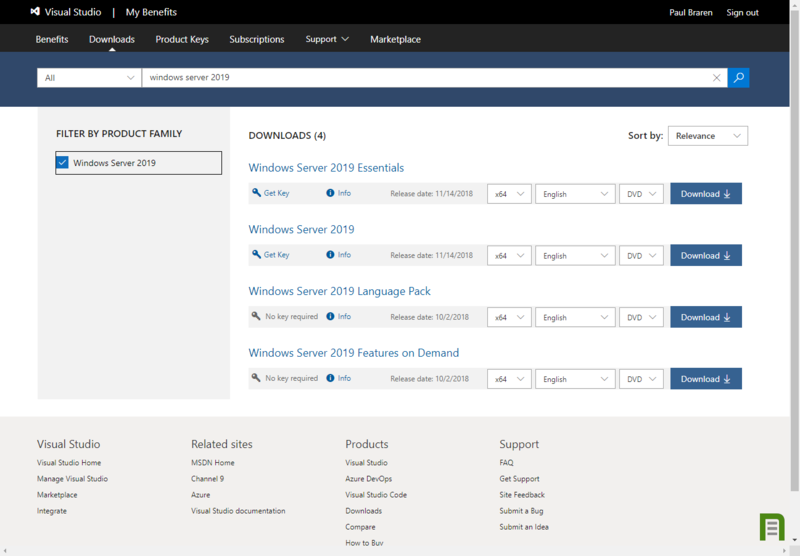 So yesterday I checked again, tada, the ISOs had become available on Visual Studio for all current subscribers, right around noon on Monday November 19. See also my tweet. Yes, this 1809 (09 for month of September, 18 for year of 2018) re-release is said to incorporate the fixes for both the missing files/folders and ZIP bugs resolved. Interesting to note that we never really heard if these issues affected the pulled Server 2019 release. Also interesting they didn't just rename the whole thing to version 1810, which sure would make downloaded ISO filenames much more self-evident. 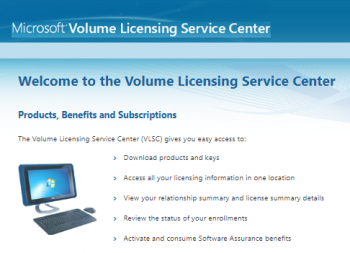 Don't forget to delete any of those old ISOs you may have downloaded last month! Here's one of many free ways to do a full system back up before upgrading, just-in-case. 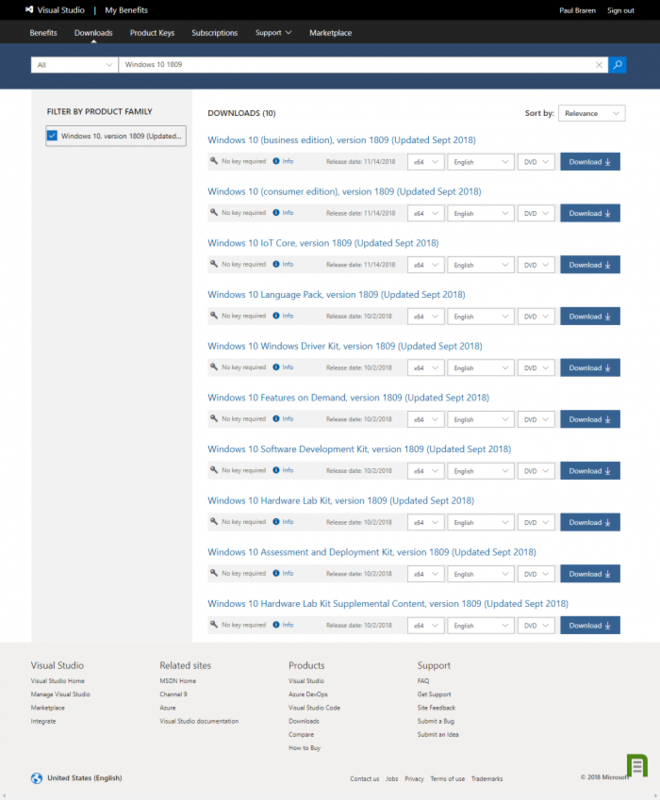 You can read all about why I'm very glad I backed up last month, prior to installing the first 1809 release. Back up your entire system first. Click on Start, type Check for updates and hit enter, the Windows Update dialogue should come up. 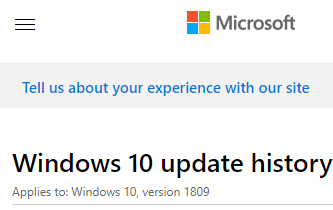 As of Nov 20 2018, seeking an update this way has not resulted in an offer of version 1809, but I would imagine Microsoft may be exercising a bit of extra caution this time around, for good reason. 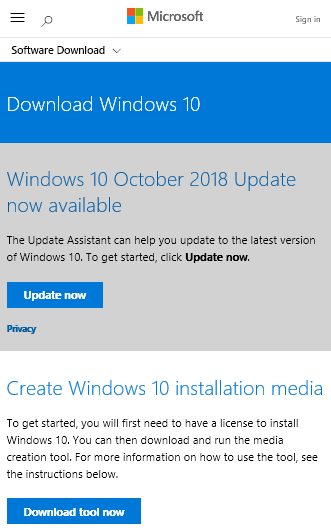 This offers you the Update Assistant and Create Windows 10 installation media methods, including the direct link to download the wizard-based MediaCreationTool1809.exe. 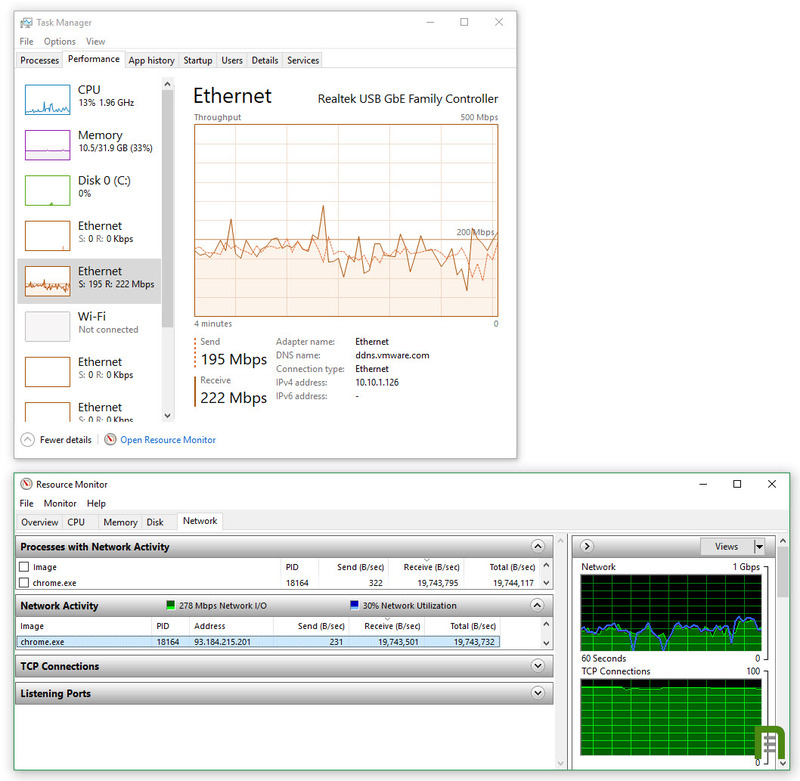 Works very nicely for anybody doing lab testing or Golden Master template VM creation, with no subscription or log in required. 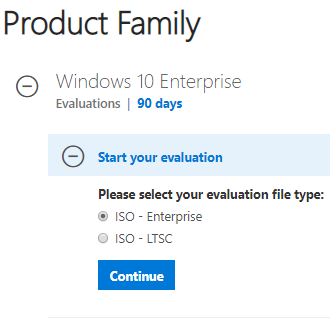 The only evaluation of Windows 10 that I'm currently able to locate is Windows 10 Enterprise link above, compare Windows 10 in S mode, Windows 10 Pro, and Windows 10 Enterprise. Once status changes, I plan to update this article accordingly. 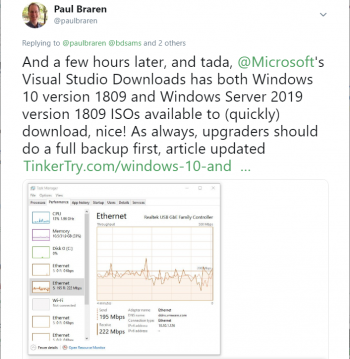 I don't have access to verify this myself, but this Windows 10 tweet by @TomodWolf and this Windows Server 2019 tweet by @x233t mention availability (again) on VLSC in mid-November. See also Microsoft's Windows 10, version 1809 rollout resumes; now available on VLSC, which requires login to view. 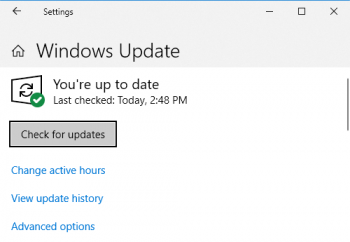 Microsoft's Windows 10 update history article added above. For archival reasons, I figured it might be helpful to grab some more screenshots I took when preparing this article for it's publication on Nov 20 2018.